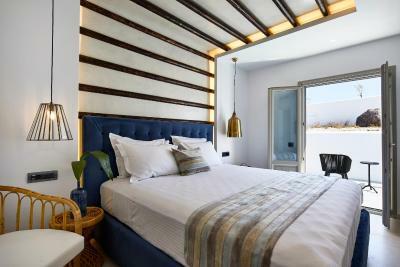 Lock in a great price for Phos The Boutique – rated 9.6 by recent guests! Pho’s truly left us speechless! I’ll start off by saying Ada and Anthony were exceptional hosts that truly went above and beyond from the very start to finish. They made our stay unforgettable! We really can’t wait to visit again soon!! There wasn’t one request that went unattended. They treated us like royalty! Now to the hotel, The pictures truly doesn’t do it any justice. 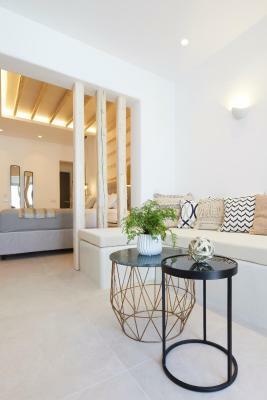 From the moment you arrive, the heavenly white exterior and the beautiful, luxurious interior design you truly can’t help but to photograph every corner of it! The room was impeccable!! We stayed at the elite suite with the private heated infinity pool, we never wanted to leave! The cleanliness, the decor and interior design was very well done. Once you walk out to the infinity pool it feels like you opened up the gates to heaven!! I 100000% recommend this hotel!! We cannot day enough good things about this hotel! 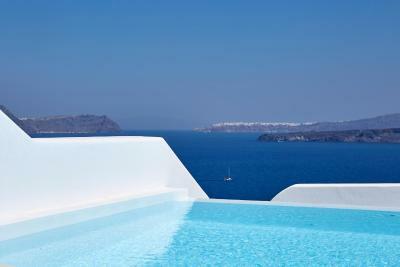 The location is out of the hustle and bustle of Oia and Fira, but gives you quiet intimacy, with spectacular views. The staff was beyond amazing. Anything we needed was brought to us, including our rental car. They were even sweet enough to arrange a car to take us to a nearby restaurant the day before we decided to get a rental car. Breakfast was great as well. We highly recommended this hotel. We only stayed one night and got the prestige room. The staff was very welcoming and lovely! 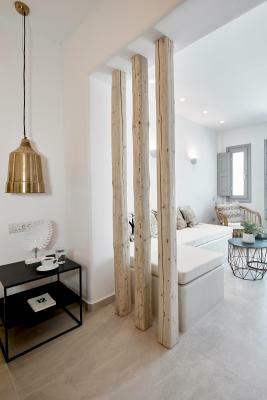 I loved the minimalistic interior of the room, what you see on the pictures, is what you get for real! The private pool was bigger than expected and warm (a plus during the evening when you want a swim while watching the sunset!!). The breakfast is personally delivered to your room in the morning. Definitely recommend staying here if you want to escape the crowds from Fira and Oia, it was very relaxing, private and quiet. We had the honeymoon sweet, it was perfect, the breakfast was really generous and tasteful. Moreover, we stayed for three nights, and we had a honeymoon arrangement by the hotel with a sweet and a bottle of Champaign, it really made our day and honestly .. it worth it. The staff were helpful so kind to us Ada and Athena were really great with help and smile on their faces. They showed us how to experience the beauty of Santorini. We appreciate their assistance and advise. All the staff were so friendly and made us feel as ease. The service was excellent down to the small details. The room was beautiful and luxurious. It was kept very clean and was refreshed most days. It really was the perfect honeymoon setting and the best hotel I have ever had the pleasure to stay in with my new husband. Thankyou so much phos! 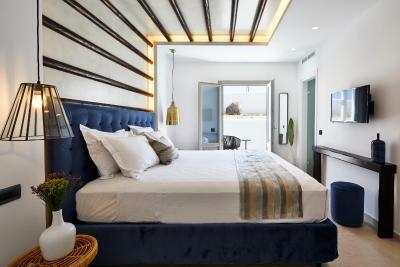 This hotel was everything we have dreamed of for our stay in Santorini . The view of caldera was breathtaking. The room was big , luxurious and clean! We were more than happy , that we had the chance to feel like summer during November, as we enjoyed our own private heated pool with the ideal temperature of the water , that made me want to stay there forever .We took long walks around and watched the sunset from the lighthouse near the hotel . I travel a lot around the world and I can reassure that our overall stay was one of the best we had in years ! I definitely recommend this hotel and I cannot wait to come back next year . Amazing property with breathtaking views from the rooms. Excellent breakfast and what a lovely staff. We had the honeymoon suite which is quite exquisite. The management was kind enough to extend our stay for an extra day at a very affordable rate, All in all quite a memorable honeymoon all thanks to Phos! The breakfasts were amazing! Fresh fruits, fantastic pancakes, and great bread selections. They call you the night before and ask when you'd like to be served. The staff was outstanding! We stayed here for our honeymoon and enjoyed every minute of our stay. The view is truly astonishing! The receptionist is very kind, lovely, and helped us with everything we need. She also welcomed us with a delicious homemade lemonade to our room. Thank you! :) The room was very comfortable, clean and loved the designs, also the bathroom smells so good. The hotel location was perfect for us. It is a calm area. I wouldn’t stay in oia due to the amount of people in there, the touristic place is way too crowded even though we went off season. The view is no less amazing than the famous places. We rented a car and its about 35 mins ride to go around Santorini island passed by imerovigli, fira and oia with an amazing scenery along the way. The private pool was our favourite spot. 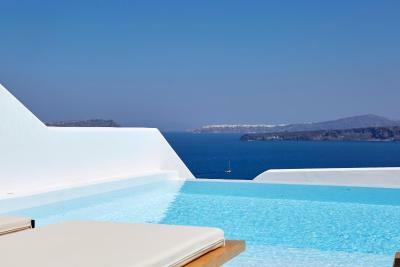 Its warm, refreshing, divined pool and view! The breakfast was big, complete and delightful! Overall, this place is super recommended. Thank you Phos the boutique! 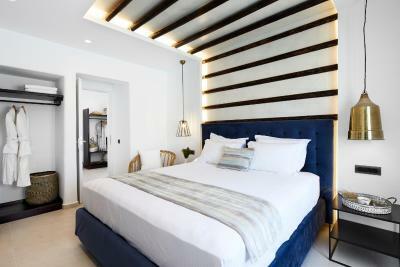 Phos The Boutique This rating is a reflection of how the property compares to the industry standard when it comes to price, facilities and services available. It's based on a self-evaluation by the property. Use this rating to help choose your stay! 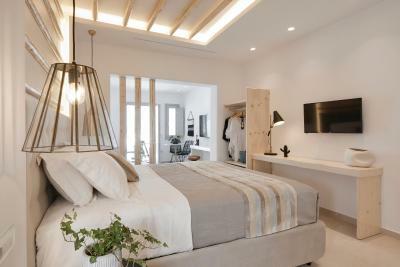 One of our top picks in Akrotiri.Phōs the Boutique is a 5-star luxury hotel, perched on the edge of the Caldera in Akrotiri offering unobstructed Caldera views. 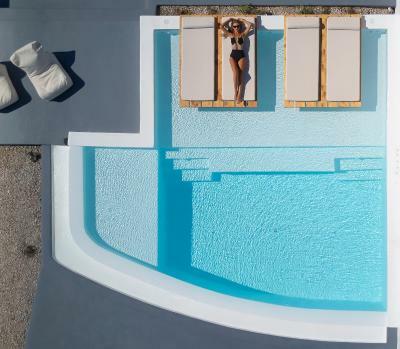 All of the spacious villas and suites offer private heated infinity pools with hydro-massage jets and sun terraces with outdoor lounges. 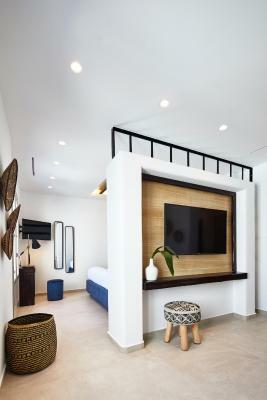 The architecture of the hotel blends modern and traditional design along with tropical elements. 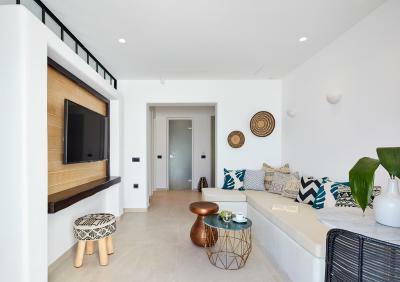 Each suite or villa is individually decorated boasting large satellite flat screen TVs, Blu-Ray players, smartphone docking stations and free WiFi. 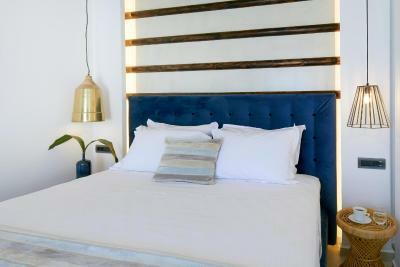 Room amenities include king size beds, bathrobe and slippers and top quality organic toiletries. Breakfast is served à la carte and can be enjoyed at the privacy of the guest’s room or by their private pool. Contemporary Mediterranean dishes from fresh local products are prepared for lunch and dinner. The hotel also offers a private VIP transfer service with modern luxury SUVs. 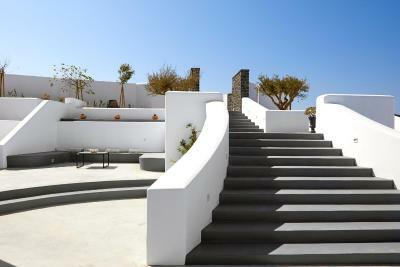 Phos The Boutique is located 2.2 mi away from Athinios Port and 6.8 mi away from Santorini Airport. 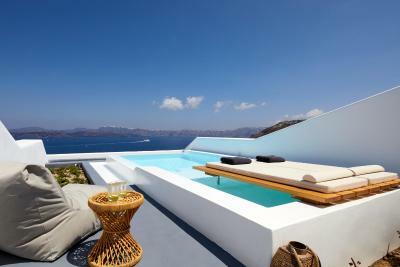 The vibrant capital of the island, Fira is 4.3 mi away. Free parking is provided on site. 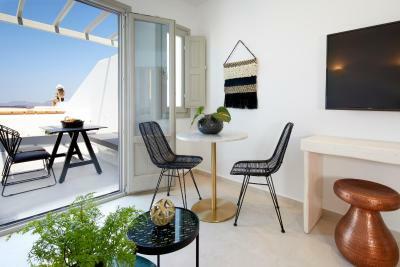 When would you like to stay at Phos The Boutique? This suite has a balcony, DVD player and mini-bar. This villa features a balcony, DVD player and dining area. House Rules Phos The Boutique takes special requests – add in the next step! Phos The Boutique accepts these cards and reserves the right to temporarily hold an amount prior to arrival. I highly recommend renting a car! Amazing hotel. I had a great time! Water van de douche was niet zo warm.. It was a little far from the main town. But if you're looking for a remote location with no distractions, it's your place. The private pool was amazing! It rained both nights we were there, and the wind was ridiculous, so we couldn't really use it.